PHOENIX – Ready or not, here they come. Joining in the Super Bowl festivities this week will be more than 70 CEOs invited from around the world to visit Arizona to see what the state has to offer. “Arizona is the place to be,” Gov. 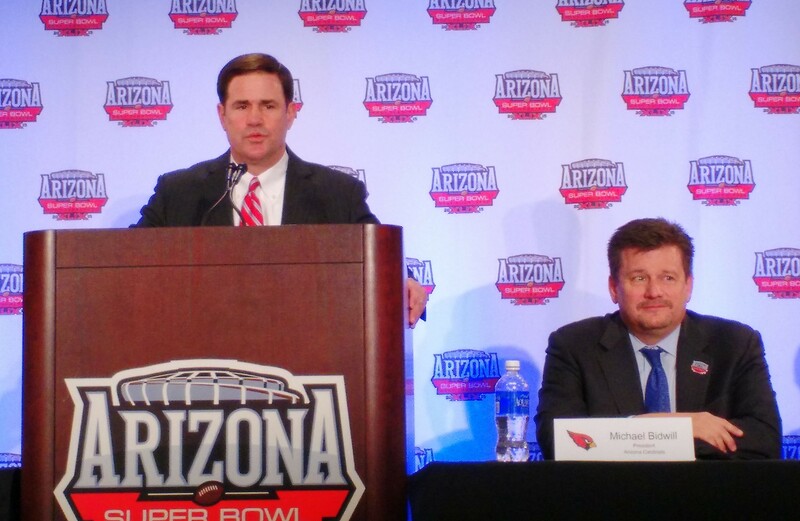 Doug Ducey said at the Arizona Host Committee’s official welcome press conference Monday. Arizona Cardinals President Michael Bidwill is working shoulder-to-shoulder with Ducey to try and lure businesses to the state. They will pitch Arizona as a great opportunity and environment for companies. Host Committee Chairman David Rousseau said CEOs start arriving Thursday with a welcome reception at the Waste Management Open that day. A forum is scheduled at the Biltmore Hotel Friday where CEOs will listen to Arizona’s pitch. The committee is paying for airfare, tickets and hotel accommodations with expenditures coming out of a corporate fundraising pot. Ducey will wrap up visits Sunday. Also at the press conference, Host Committee President Jay Parry announced a special event Thursday to be held during the Verizon Super Bowl Central event recognizing the Latino and Native American communities. Gov. Doug Ducey, left, and Cardinals President Michael Bidwill are using the Super Bowl to attract new businesses to Phoenix.